Wed, Apr 19 Subscribe to Disney Junior, just $13.99/year from DiscountMags.com! 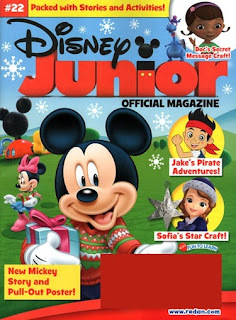 Disney Junior magazine is a periodical that has been created specifically for preschoolers. Each issue is packed with fun activities and magical stories that you and your child will enjoy doing and reading together. Every time you receive this publication in the mail, your preschooler will enjoy hours of joyful entertainment. Order your child a discount subscription to Disney Junior magazine today! Every issue of Disney Junior magazine is jam-packed with great activities that are both fun and developmentally appropriate for your child. He or she will love doing activities that relate to his or her favorite Disney characters. Whether your child’s favorite character is Jack from Neverland or Princess Sofia, he or she will enjoy all the fun activities and games that come with your subscription to this magazine. Since your child loves watching the channel so much, he or she will love that their favorite characters have even more fun adventures in the stories that are included in each issue of Disney Junior magazine. Not only will your child enjoy the stories, but there are also great illustrations as well! Your child will love the stories, but you will love that this magazine is helping to cultivate a life-long enjoyment of reading in him or her. Your little one will absolutely love receiving new stories to enjoy every time this publication arrives in the mail. In addition to great activities, games, and stories, with a subscription to Disney Junior your child will also gain access to a plethora of crafts and recipes. Preschoolers are so creative and yours will love making adorable crafts to decorate the refrigerator or his or her room! Young children also enjoy making their own snacks. You will love all the great and simple ideas for recipes that you can use with your child that he or she will enjoy. Order your child a subscription to magic and fun by getting him or her a discount Disney Junior magazine subscription today!